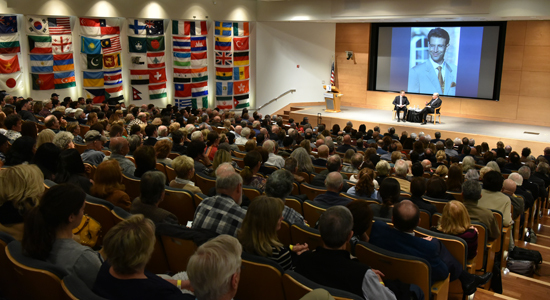 Woodward delivered the 2018–19 Daniel Pearl Memorial Lecture, hosted by the Burkle Center for International Relations. Pearl was a talented journalist and the South Asia Bureau Chief of The Wall Street Journal at the time of his death in 1992, when he was murdered by terrorists in Pakistan. The annual lecture was cosponsored by the Burkle Center, the Daniel Pearl Foundation, the Yitzhak Rabin Hillel Center for Jewish Life at UCLA and the University Religious Conference at UCLA. The speaker was introduced by Los Angeles Mayor Eric Garcetti. 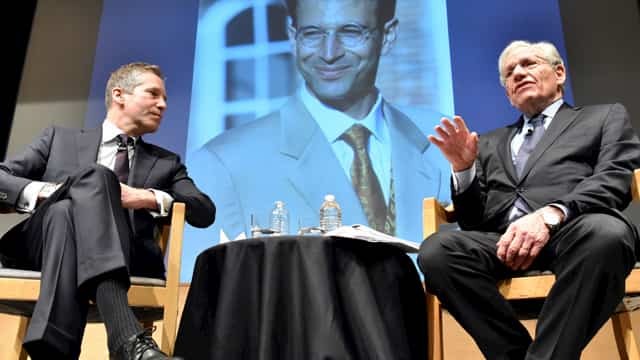 His address was preceded by remarks by Burkle Center Director Kal Raustiala; UCLA Professor Emeritus Judea Pearl, father of Daniel and president of the Daniel Pearl Foundation; and Rabbi Aaron Lerner, executive director of Hillel at UCLA. After speaking for about 15 minutes, Woodward sat down for an interview with Raustiala. Now associate editor at The Washington Post, Woodward joined the paper as a reporter in 1971. He has won two Pulitzer Prize awards for journalism: in 1973 with Carl Bernstein for their coverage of Watergate, and in 2003 for his work as lead reporter in the coverage of the 9/11 terrorist attacks. In addition to his reporting, Woodward has authored or co-authored 19 books, the most recent of which is “Fear: Trump in the White House” (2018).